Spreading fertilizer can be done in lots of ways, but some are not always effective, especially if the area or garden being worked on isn’t small. In this case, you should consider using one of the best broadcast spreaders to spread the fertilizer evenly and far more quickly than doing it by hand. 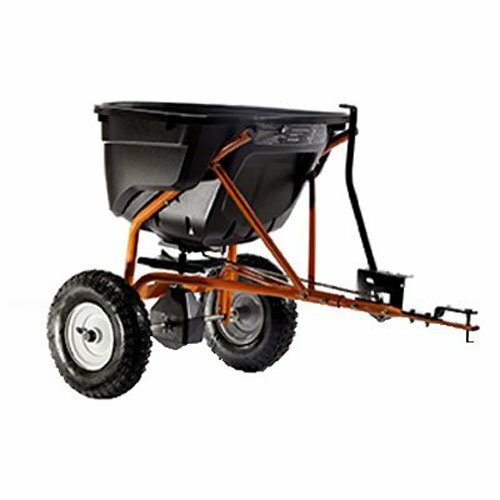 If your lawn and/or garden are of a size that justifies it, then a broadcast spreader is an ideal way of spreading fertilizer and other materials. In most cases, there is no heavy lifting required, and they help you get the job quickly and efficiently. While you may have decided you want a broadcast spreader, you may not have settled on a specific model, which is understandable, given the various designs, features, and benefits, they all have. In this buyer’s guide, we will explain which of these have the greatest importance and give you some advice on how to get the most from your broadcast spreader. The most common setup is one with a hopper, which is mounted on a frame, with an axle and two wheels. As the spreader is being pushed, the axle which the wheels are connected to is also turning. This is connected to a gear mechanism which causes discs to spin just underneath the hopper 1. When the small hatch at the bottom of the hopper is opened, the materials pour out and are spread by the spinning disc or discs. The spreading action is enhanced by the discs having slats or fans which throw the material over a wide area. We have already mentioned broadcast spreaders being used for fertilizer, and as this is their most common use, many people mistakenly think that is all they meant for. However, there are lots of other uses for a broadcast spreader, which makes their appeal even greater. If you are sowing a bare patch of your lawn, or completely seeding a new lawn, then you can use a broadcast spreader for spreading the seed. The benefit here is the seed is going to be spread more evenly, and thus promote even growth across your lawn. They can also be used for spreading other garden materials such as lime when you need to raise the pH level of your soil2. If you get cold winters and normally use salt on frozen pathways and drives, why not use your broadcast spreader instead of a shovel? It’ll certainly be easier on your back and if you continue spreading either side of your home, you should become very popular with your neighbors. We are going to assume that you are not needing the type of broadcast spreader that is used for agricultural spreading, as these larger types are tractor mounted, and beyond the scope of our reviews. There are some smaller broadcast spreaders that can be towed by garden tractors. These would suitable for use in very large gardens and some commercial purposes, such as freelance gardening. 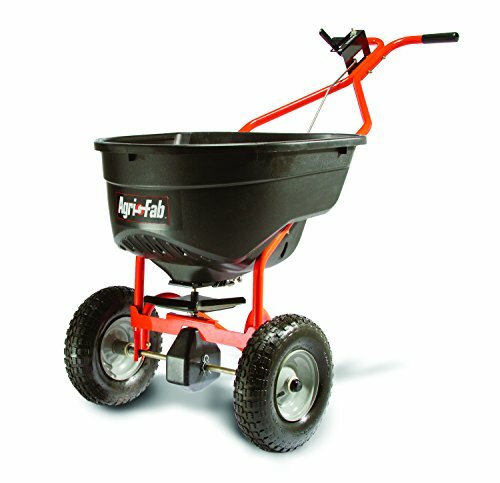 For use in domestic gardens and smaller plots, the majority of broadcast spreaders are the two-wheeled type we mentioned above, where you push them along. There will be differences in the type, quality, and size of the wheels, so look for this when comparing them. Another major difference you will see is the capacity of the hopper. Obviously, the bigger the hopper is, the more material it can hold, and therefore the more area you can cover in one run, before having to re-fill it. There is another type of broadcast spreader, which you strap to your front. As you walk forward, spreading is achieved by you cranking a handle on the side of the unit. Where these are particularly beneficial, is for spreading fertilizer or seed, where the ground underneath is severely rutted, very uneven, or has a steep incline. These are scenarios where a wheeled broadcast spreader would either be impossible or very difficult to push. 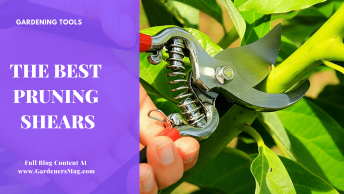 What can put off many gardeners from buying a new tool, is the possibility that it will need to be assembled and then have a complicated setup procedure. Well, if that is something that also bothers you, then rest easy. This broadcast spreader from Scotts comes fully assembled, and it has also been calibrated in advance, so you don’t have to that either. The hopper holds enough material that it could potentially be used to spread over an area of 15,000 square feet. If you are not up on your measurements, that is equivalent to 25% of the area of a football field and should be enough to cover most large gardens. The spreader has a very useful controller which lets you adjust how much fertilizer you are spreading, depending on the job you are working on. This means you can also adjust it to take account of other types of lawn food as needed to ensure the correct amount is released. Another feature you may find useful is ‘EdgeGuard’, which is how you can limit the broadcast area you are spreading. 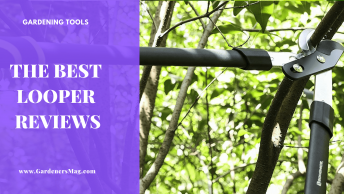 It works by preventing material being released on the right-hand side and is an effective way of preventing fertilizer or other materials being spread on certain parts of your lawn, or on border plants and which could potentially damage them. Pushing the spreader is made more comfortable by the cushioned sleeve on the handle, and the fact that the controls we mentioned earlier are within easy reach. Potential to cover 15,000 sq. ft.
We must be upfront and advise you that this broadcast spreader does require assembly, and that there are more than just a couple of parts to be put together. 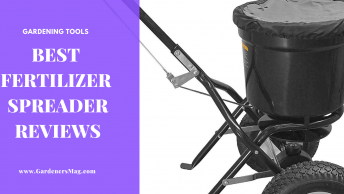 However, if that is something that doesn’t faze you, then your reward when it has been assembled, is very sturdy and effective fertilizer spreader. It is certainly a very distinctive product with a large black hopper and a frame which has been spray painted a bold reddish orange color. The hopper dominates in the center, and this probably explains why it can hold up to 130 lbs. 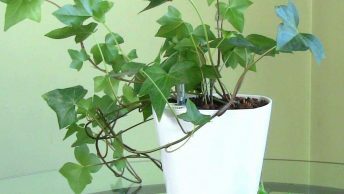 of fertilizer or other materials such as seed, lime, weed killer, lawn food or ice melt. To put the size of the hopper into perspective, it means that whatever product you are spreading, you can cover an area of up to 25,000 square feet. That is one-and-a-half times the size of an ice hockey rink, so one fill should be enough for most jobs, but if not, you can always refill it. When spreading, you can set the flow by using the control lever situated adjacent to the handlebar. This lets you adjust the amount of product that is being released to the correct level. The part which provides the drive for the spreader disc is the gearbox, and in this model, the gears are made from rust-resistant aluminum. This makes them very durable and as the gearbox is enclosed, this helps prolong the life of the gears too. Thick tread tires make pushing the spreader on difficult terrain easier, and the grips on the handlebar help to reduce any strain your hand might feel as you push it. Hopper holds up to 130 lbs. This broadcast spreader from Scotts has several features which should make the job of spreading fertilizer or other products as simple and as stress-free as you would want it to be. The first point to make is that it can be used to spread a number of different products. Apart from fertilizer, you could use it to seed a lawn, spread weed killer, or release ice melt to clear snow and ice from your pathway or drive. Being able to control the flow of any of those materials helps ensure that the most appropriate amount is released. This can be done via the control dial on the hopper, which you should set before you start pushing the spreader. The other control mechanism is the release lever which sits within the handle assembly. You would use this to open or close the hopper opening. One quirky, but useful feature is a holder which you can use to place your smartphone and thus never miss an important call while spreading. Whereas many broadcast spreaders have one gearbox and thus just one spreader rotor, this model has two of each. This means that it can spread to a wider angle of up to 6 feet, which is much wider than many spreaders can achieve. The main benefit of this is it makes any spreading job quicker as you can spread the product on a larger area with each run you make. We move now from broadcast spreaders which you push, to one which you pull. Well, when we say ‘you,’ we don’t mean you physically pull it, as this broadcast spreader from Agri-Fab, is one which is towed. It has a universal connector bar, so it should be suitable for most garden tow carts, trollies or tractors. 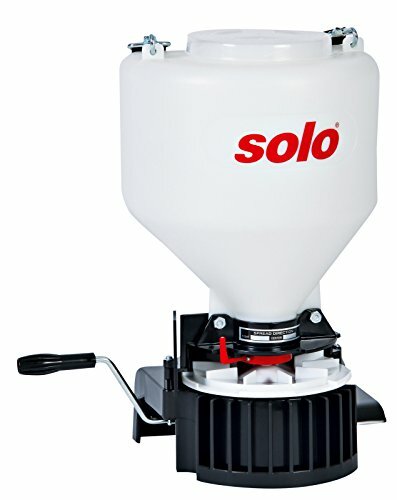 This sort of broadcast spreader is most suited to larger gardens, and as such, you would expect it to have a hopper congruent with it having to spread a lot of product over a larger area. That need is satisfied, thanks to its capacity of 130 lbs., which means it can cover up to 25,000 square feet in one run, depending on the type of material you are spreading. Before moving off you can set the flow controller so that the hopper releases the exact amount you need for the material type and job you are starting. Once you have set the flow rate you can start driving your tow vehicle and begin to spread the product. If at any time you need to stop spreading, you can easily reach the on/off lever from where you are sitting. This prevents excess material being released on to one small area and saves wasting any material too. So far, we’ve had broadcast spreaders which you push, and one which you pull, and now we are going to look at a broadcast spreader which you carry. 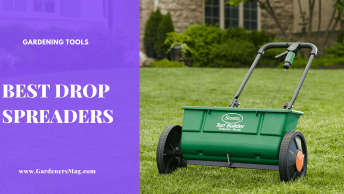 The principle behind this spreader is that it has a strap which you hang around the back of your neck and then walk forward with it in front of your chest. As you walk, you crank a handle on the side of the unit, which releases and spreads the material which is inside. 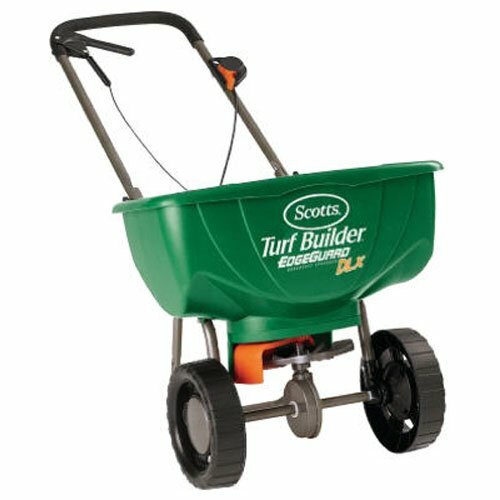 You may have released that as you are carrying this spreader, the amount of material than it can reasonably be filled up with, is going to be a lot less than some of the other spreaders we’ve looked at. Specifically, it can hold 20 lbs. of material, so this is a spreader suited to small gardens. This spreader is also a solution for when a wheeled spreader would simply be impossible to use such as on very steep incline or very uneven terrain. The design of the spreader disc is such that it will only spread materials to the front and side of you as you are walking. You can adjust the flow of the material, and make adjustments to the direction, using levers which you control with your hands. The one issue we have is, that as this is at the front, it is difficult to see as the hopper is in the way. It has multiple uses including seeding or spreading salt to melt ice, and as it is constructed from mostly plastic and stainless steel, it should not suffer from rust or corrosion. 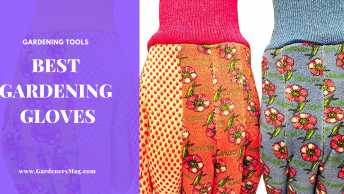 There are lots of great products in this category, and the choices available in terms of sizes, types, and capacities are significant. 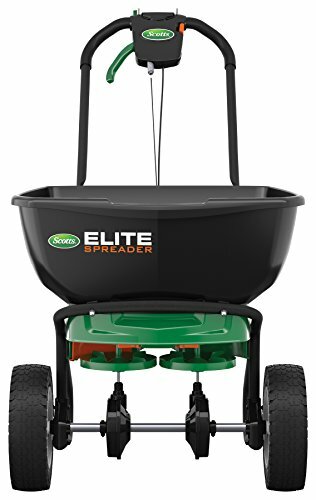 Of them all, we believe the best broadcast spreader to be Scotts Elite Broadcast Spreader. This has a hopper with a good capacity, has a wider spread angle thanks to having two spreader discs, instead of one, and the flow of the materials can be easily controlled. While not the clincher, the fact it has a smartphone holder, was the final touch.